How often do you think (or hear), “I could never homeschool. I’m not patient enough with my kids! We would drive each other crazy!”? It seems the minute we give birth, the guilt and self doubt sets in. Add on top of that, the immense responsibility to raise a responsible and capable adult! Who wouldn’t worry about adding on another responsibility – one that is typically handled by professionals? I don’t think of myself as a patient person, but here are a few reminders that have helped me ease into homeschooling, and gain some added patience, alhamdulilah (praise God). Think about it – do teachers have DNA that make them more patient than the next person? Until I’m proven otherwise, I’m going with an answer of “no.” The fact is, when someone is hired to do a certain job, there’s an expectation that they will perform it regardless of their personal feelings on any given day. Customer service professionals get yelled at on a regular basis, but it is never okay for them to yell back. Likewise, teachers are expected to keep their cool throughout any situation. When you start thinking of homeschooling as your profession, and something you pride yourself in, it’s amazing the patience you can exhibit. You won’t ever be perfect, but I am confident that when the realization sets in that patience is more important than giving into an immediate emotion, it will get better. It’s worth mentioning also that you can’t compare a day of school break with a homeschooling day. When the kids are used to the routine of going to school, and then break that routine to stay at home with mom, it is a completely different story than when the kids’ routine consists of homeschooling. When kids are on break, it can be hard to know what to do to fill the day, and everyone can get on each other’s nerves. Everyone’s routine is broken and it’s all out of whack. Change is rarely immediate. I can’t even promise that it will turn around in a year, but in my experience, each year does get better. Each year you find another way to address the same annoyances that would pester you in the past. Each year you learn to walk away from a battle that isn’t important enough to fight. And each year, you learn how to ask your kid for forgiveness when you slip up. Throughout this process, the entire family is getting a lesson on communication skills, being humble, and in general building healthy relationships. Patience is a virtue, and not because it comes easy. It is a virtue because it takes hard work to maintain. Also ask yourself, “What bad thing is happening because of my lack of patience?” Are your children forever scarred? Did you throw things at the wall? Did you say mean things that you can never take back? Most likely you don’t do any of these things when you lose your patience. A little yelling out of frustration never killed anyone. Don’t get me wrong, I don’t encourage yelling! But let’s be realistic, the typical mother yelling, “I told you to take out the trash 10 times!” didn’t land anyone in therapy. I don’t consider myself a patient person, and I’ve definitely had moments where I’d like to go back and redo it, this time with far more patience. Still, I can say that as I realize how impatience hurts everyone and makes no progress, I’ve gotten a lot better. Don’t give up before you try. Give yourself a little credit! Walaykum assalam, we’ve actually considered moving to Sweden, so that’s good to know! Alhamdulilah, I’m glad you’ve enjoyed the blog. Hope to see you around some more! Ramadan Kareem! In sha Allah this is the most beneficial Ramadan for you yet. We have a similar length fast from 3:30a to 9p. Myself and Care Bear will be staying up until Fajr each day to try to get enough food and drink in before the long fast, in sha Allah. Switching nights and days isn’t really recommended, but for these long days, it seems best. Since Sweden doesn’t allow homeschooling, we probably wouldn’t move there. I love being home with my kids and educating them. Sweden came up because it’s a neutral country and that would be a welcome change from the US’s foreign policy. This is fantastic. 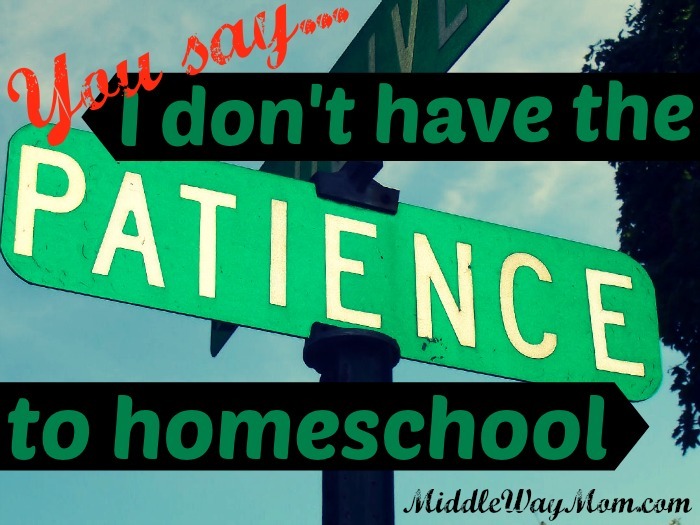 I think people get the wrong idea and think patience is a major factor in homeschool. It isn’t. The satisfaction of teaching your children outweighs any test of patience one might anticipate. I like the point that we cannot compare our homeschooled children to the schooled children. That is the thing that my mom always do and it really makes me sick. I think we need to face what happen at the moment and concern with it rather than worrying about the future when kids have to adjust themselves to the real society. I’ve heard many people also give note that a school is a pretty artificial environment in comparison to the work force, or adult life in general. Rarely do we group ourselves based on birth year and geographic location. Instead we make friends and work together with people with similar interests and abilities.